Auriculotherapy or Ear Acupuncture is the stimulation of the auricle of the external ear for the diagnosis and treatment of health conditions in other parts of the body. It is also known as ear acupuncture or auricular acupuncture when the stimulation is achieved by the insertion of acupuncture needles, whereas the term auriculotherapy often refers to electrical stimulation of the surface of ear reflex points. 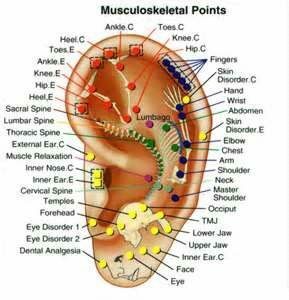 Specific points on the ear can also be stimulated by manual pressure, referred to as auricular acupressure or ear reflexology. Acupuncture points on the ear can also be stimulated with lasers, magnets, and ear pellets. How is Auriculotherapy or Ear Acupuncture different from Acupuncture? Auriculotherapy is typically considered one form of acupuncture, but there are both differences and similarities between the two procedures. Acupuncture is a form of medical treatment involving the stimulation of acupuncture points located on energy channels extending over the surface of the body, which are known as meridians. From the philosophy of Taoism, there are six Yang meridians and six Yin meridians. In classical acupuncture, it is the Yang meridians that directly connect to the external ear. These energy lines of force are blocked or congested when there is some pathology in a specific area of the body. Insertion of acupuncture needles into specific acupoints can relieve the symptoms and underlying pathology of a particular health problem. Some of the meridian energy lines of force connect to the external ear, thus creating the field of auricular acupuncture. Different perspectives of auriculotherapy focus not on the acupuncture meridians but on the use of the ear as a localised reflex system connected to the central nervous system. What is the History of Auriculotherapy or Ear Acupuncture? The earliest written records of ear acupuncture date back to the Yellow Emperor’s Classic of Internal Medicine, a compilation of acupuncture procedures that were in practice in 500 BC. Within this extensive text that covers a variety of acupuncture treatments, there is mention of specific acupuncture points on the external ear for the relief of certain medical disorders. However, the manner in which auricular acupuncture is practiced today in China is actually based upon more recent discoveries that occurred in France in the 1950’s. The Traditional Oriental Medicine practiced in ancient China included just a scattered array of acupoints on the auricle for just a few health problems, whereas the current practice of auricular acupuncture shows a complete organisation of ear reflex points that can be used to relieve many health problems. In the West, the earliest references to ear treatments were referred to in medical records from ancient Egypt, Greece, and Rome. The complete descriptions of medical treatments through the ear were recorded in ancient Persia. A trail of evidence of the use of auricular stimulation for the treatment of sciatica back pain can be followed from these Persian records through medieval Europe to modern France. Since the 1950’s, the use of specific ear points as a complete reflex system that can alleviate many health problems has been utilised by clinical practitioners in other parts of Europe, in Asia, and in North and South America. Who discovered Auriculotherapy or Ear Acupuncture? While the earliest uses of ear acupuncture points dates back to ancient China, modern applications of auriculotherapy are based on the work of Dr. Paul Nogier of Lyon, France. In the 1950’s, Dr. Nogier noticed a strange scar on the upper ear of some of his patients. He found that all of them had been treated for sciatica pain by a local lay practitioner. This woman had cauterised a specific area of the external ear in order to relieve their low back pain. Dr. Nogier conducted a similar procedure on his own sciatica patients and found that their back pain was also reduced. He then tried other means of stimulating this “sciatica point,” including the use of acupuncture needles, and found that they too were effective in alleviating sciatica pain. The brilliance of Dr. Nogier was in extending this one observation into a more comprehensive model. Dr. Nogier theorized that if an area of the upper external ear is effective in treating low back pain, maybe other parts of the ear could treat other parts of the body. The ear is said to represent the whole anatomical body, but in an upside down orientation. Nogier’s theory contended that the auricle could be compared to an inverted foetus, with the head represented on the lower ear lobe, the feet at the top of the external ear, and the rest of the body in-between. This model was first presented to naturopathic practitioners in France in 1957, then spread to acupuncturists in Germany, and finally was translated into Chinese. The Chinese seemed to have adopted the inverted foetus model of ear acupuncture in 1958. How is Auriculotherapy or Ear Acupuncture related to other forms of Alternative Medicine? 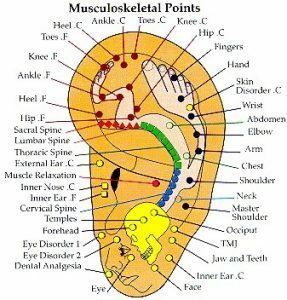 Auriculotherapy is considered one form of alternative medicine, which also includes acupuncture, chiropractic manipulation, homeopathy, and biofeedback. All of these techniques are also referred to as Complementary Medicine, in that they are not only an alternative to conventional Western medical treatments, they can serve as an additional procedure which complements the practice conventional medicine. Auriculotherapy can reduce the tension, stress, and pain not fully relieved by other medical procedures, but works best when implemented as part of a multidisciplinary complement of multiple treatment approaches. While ear acupuncture is often used in conjunction with body acupuncture, auriculotherapy can also effectively relieve pain, stress and tension when used by itself. Is Auriculotherapy or Ear Acupuncture accepted by Conventional Western Medicine? While ear acupuncture has been practiced in Asia for over 2,000 years and auriculotherapy has been used in continental Europe for the past 40 years, it is only recently been considered by most medical doctors in the United States. Most MD’s do not have sufficient information about auriculotherapy to make an informed comment on its effectiveness. In November of 1997, a consensus panel of the U.S National Institutes of Health gave conditional approval of the practice of acupuncture. They included an evaluation of those studies which supported the use of ear acupuncture for pain relief and addiction treatment. As more research accumulates on the efficacy of auriculotherapy, it is expected that even more physicians will acknowledge the benefits of auriculotherapy. The word microsystem has also been referred to as a micro-acupuncture system or a micro-reflex system. The auricle serves as a microsystem in that the external ear is like a microcosm of the whole body, with one part of the body representing the whole body. This phrasing distinguishes a microsystem from the macro-acupuncture system of meridian channels that extend over the whole body and the nervous system connection of reflex pathways that inter-relate different parts of the body. Microsystems have been reported for foot reflexology, hand reflexology, face acupuncture, scalp acupuncture, and iridology. The term Microsystem was first popularised by the acupuncturist Ralph Alan Dale of Miami, Florida. As with distal acupoints in body acupuncture, the auricular microsystem can be used to treat health conditions in distant parts of the body. Stimulating points on the ear not only can alleviate problems associated with nearby regions of the face and head but can also relieve pathological disorders in the chest, abdomen, lower back, and feet. According to microsystem theory, it is not that there are direct connections between the ear and the back or the ear and the foot. Rather, nerves from the ear connect to reflex centres in the brain which send neurological reflex pathways to the spinal cord and then to neurons going to the spine or to the foot. The basic concept in auriculotherapy is that nerves in the skin overlying specific areas of the external ear correspond to specific parts of the brain which has reflex connections to the body. Organo-Cutaneous Reflexes are activated when organic pathology in a specific part of the body induce reflex reactions in the external ear, manifested as localised changes in tenderness, altered blood circulation, and electrodermal reactivity. Cutaneous organic reflexes are activated when specific points on the auricle are stimulated in order to relieve organic pathology in another part of the body. The inverted foetus pattern that is represented on the auricle is referred to as somatotopic inversion. The word “soma” means “body” and the word “topic” refers to a topographic “map.” The auricle is a map of the body in an inverted or upside down pattern. What is the effect of wearing Earrings? A common thought that occurs to many people is to question the consequence of wearing earrings when they are located at auricular acupuncture points. The classical location of earrings placed at the centre of the ear lobe occurs at the eye point and has been reported to relieve visual disturbances. The response of ear reflex points to earrings depends on both the healing of the skin tissue where the ear has been pierced and the type of metal used in the earring. If the skin where the ear has been pierced has not completely healed, the metal in the earring can release electrically charged ions into the skin. Whether those ions help or harm any pathology in the corresponding part of the body depends on whether the metal is gold, which releases positive ions, or silver, which releases negative ions. What health conditions are most helped by Auriculotherapy or Ear Acupuncture? Because every part of the external ear connects through the microsystem remote reflexes to every part of the body, a wide variety of health problems are relieved by auriculotherapy. Almost all health conditions can be affected to some degree by stimulating reactive ear points. The most commonly reported uses of auriculotherapy have been for the control of chronic pain, detoxification from addictive drugs, relief of nausea, and reduction of hypertension. How does Auriculotherapy or Ear Acupuncture affect pain conditions? Most chronic pain is due to myofascial pain, related to the constriction of the connective tissue surrounding muscles in spasm. Muscles do not remain in spasm unless there are motor neurons causing them to contract. Maintenance of pathological muscles spasms is due to pathological brain reflex patterns that keep spinal reflex re-initiating the activation of the motor neurons that cause muscles to sustain their contraction. By stimulating ear reflex points that connect to the somatotopic reflex system in the brain, the pathological brain patterns can be electrically reset stop the unwanted activation of spinal reflexes. Pain sensations that are due to irritated nerves can be relieved by the normalising of pathological, hypersensitive reflex pathways that interconnect the ear microsystem and the somatotopic brain. In addition to these neurological explanations, it is also theorised that pain relief from auriculotherapy is achieved by the hormonal release of endorphins into the blood. From a Traditional Oriental Medicine perspective, pain is due to the blockage of Qi (pronounced ‘Chee’) energy in the acupuncture meridian channels, thus creating an imbalance in the macro-acupuncture system. By stimulating specific ear points in the auricular microsystem, bi-directional connections are activated in the body macrosystem which leads to a balancing of energy and an increase dflow of Qi. How does Auriculotherapy or Ear Acupuncture affect drug abuse? As with pain control, explanations for the effectiveness of auriculotherapy in facilitating the reduction of drug abuse derive from both a Western neurological conceptualisation and a Traditional Oriental Medicine perspective. The first evidence of the power of auriculotherapy in reducing the substance cravings of drug addicts came from H.L. Wen of Hong Kong in the 1970’s, and was expanded upon by Dr. Michel Smith, a physician who practices Oriental Medicine in New York City. The Lung point on the ear used to relieve addiction disorders is said to affect the energy of the Lung meridian, which affects not only respiratory disorders but problems with detoxification. A Western neurological explanation of drug detoxification with auriculotherapy is based on the observation that the concha area of the ear which is used to treat addiction problems represents the control of the autonomic nervous system through the vagus nerve and through the hypothalamus of the brain. How are other conditions relieved by Auriculotherapy or Ear Acupuncture? By facilitating a balancing of energy throughout the body macrosystems or by correcting pathological reflex centres in the brain, stimulation of the auricular acupuncture microsystem can lead to a homeostatic state whereby any form of stress or pain is lessened. Stimulation of the specific ear reflex points that correspond to a particular area of the body leads to either a reduction of excess stimulation or an enhancement of diminished under activity of the affected region. The overall effect of auriculotherapy is to create a more balanced condition throughout the body. Can one do these treatments on one’s self? While the insertion of acupuncture needles into any part of the body requires approved training in acupuncture or medicine and the electrical stimulation or laser stimulation requires a comparable health care license, anyone can learn ear reflexology. By placing firm but gentle pressure on the relevant tender regions of the ear, one can achieve relief of discomfort in specific parts of the body. How long do the benefits of Auriculotherapy or Ear Acupuncture last? The range of responses to an auriculotherapy session are quite varied, but it is common that a patient suffering from severe pain will notice a mild to marked reduction of their complaint on the very first session. This reduction in their pain experience can actually improve for the next several hours after treatment, but the benefits often begin to subside several days after the first treatment. With each successive treatment, the degree of pain relief usually becomes more and more prominent and the duration of pain relief progressively extends from several days to several weeks. With smoking cessation and drug detoxification, the benefits of auriculotherapy can last several weeks after just one or two auricular treatments. There is no set number of treatments for any health condition treated by auriculotherapy, but it is common that the severity of most conditions are moderately reduced by four to six sessions and greatly alleviated by eight to twelve sessions. The number of treatment sessions per week depends on the schedule of the patients, as well as the severity of their health condition. When possible, severe conditions can be treated on a daily basis, but many patients are not available to come in that often. Typically, patients are given two treatments per week for two to three weeks, then once a week for several more weeks. The frequency of sessions progressively decreases to once a month as the medical disorder becomes less pronounced. While the first auriculotherapy session requires greater time for an intake evaluation and patient history, a typical auriculotherapy treatment lasts 15 to 30 minutes. With auricular acupuncture, four to six acupuncture needles are inserted and left in place for approximately 20 minutes. In transcutaneous auricular electrical stimulation, each ear reflex point is first detected then stimulated for 10 to 30 seconds, requiring a total of 20 minutes for successively treating six to twelve points on each ear. How does auricular needle insertion compare to electrical stimulation? While both the insertion of acupuncture needles into the skin of the ear and the transcutaneous electrical on the surface of ear reflex points can effectively alleviate various health conditions, the effects of electrical stimulation usually produce more rapid pain relief. Does it matter what frequency of stimulation is used? Practitioners of Traditional Oriental Medicine usually stimulate body acupoints and ear acupoints with an alternation of slow and fast frequencies, whereas followers of the work of Dr. Nogier use a frequency specific pattern that depends on different zones of the ear. While stimulation frequency may have some impact, the location of the ear point stimulated is a more critical factor. Is an electrical point locator necessary for detecting ear reflex points? In ancient China, electrical point locators were not available, and modern practitioners of Traditional Oriental Medicine do not usually use point locators to detect body acupoints. Nonetheless, more accurate localisation of auricular acupoints is achieved by first detecting a point with an electrodermal measurement device. Unlike the wide spaced body acupoints, ear points are only a few millimetres from each other. Moreover, increased electrical skin conductance at an ear reflex point is one of the primary indicators that there is pathology in the corresponding part of the body. Greater electrical conductance at body acupoints is found whether or not there is pathology in any underlying condition. What are ear seeds or ear pellets? Small adhesive band-aids are often used to hold a small grain or a small metal ball onto a specific area of the ear to allow for maintained pressure at that ear reflex point. What are the contraindications for Auriculotherapy or Ear Acupuncture? As with other forms of acupuncture, there are few contraindications for the use of auriculotherapy. It is important not to treat any pain needed to diagnose an underlying problem, not to treat any pain needed to limit the range of movement of an injured area of the body, not to treat women who are pregnant, and not to electrically stimulate the ear points of patients with a cardiac pacemaker. What are the side effects that occur from Auriculotherapy or Ear Acupuncture? Because tenderness of ear points is one of the primary diagnostic features of auriculotherapy, soreness on the ear points stimulated can sometimes continue for up to an hour after the treatment.